 and can provide detailed, practical advice on turning your signage ideas into finished quality products from the very first meeting. every step of your project, and have a working knowledge of a variety of trade disciplines and skills related to the signage industry to help you along the way (including carpentry & electrical work, graphic design, shop front painting, fixing and council advice, and much more). Big or small, all you need is an idea. Let us worry about the rest. Knowledge and experience are what sets us apart from our competitors, and our friendly, straight forward approach is what keeps our customers coming back.